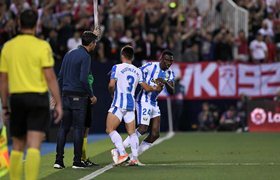 Kenneth Omeruo finally made his long-awaited La Liga debut following his introduction in the 29th minute of CD Leganes' 1-0 win over Rayo Vallecano at the Estadio Municipal de Butarque on Saturday evening. The Nigeria international, who signed for Leganes on loan from Chelsea in the summer transfer window, was a non-playing substitute against Real Madrid, Villarreal and Real Betis prior to his maiden appearance in the Spanish topflight. Despite being inactive for close to a month, with his last game against Seychelles in an AFCON qualifier, Omeruo showed no signs of being rusty and had an impressive debut. CD Leganes were already ahead when the Super Eagle replaced Unai Bustinza thanks to Guido Carrillo's 14th minute strike and the central defender helped goalkeeper Pichu Cuéllar to post a shutout. Omeruo assisted the four-man defense cope with the loss of Bustinza, who has started six times for Leganes in the league this season, and chased everything that came his way. According to the statisticians at Whoscored, the Nigerian made a game-high six clearances, an honor shared with teammate Dimitrios Siovas and Rayo Vallecano's Abdoulaye Ba, though it must be said that he spent fewer minutes on the pitch. In other stats, Omeruo made two interceptions and committed only one foul in 61 minutes of action.